Numerous campus area streets will be closed to accommodate UW–Madison students who will be moving into university residence halls starting on Sunday, Aug. 26. 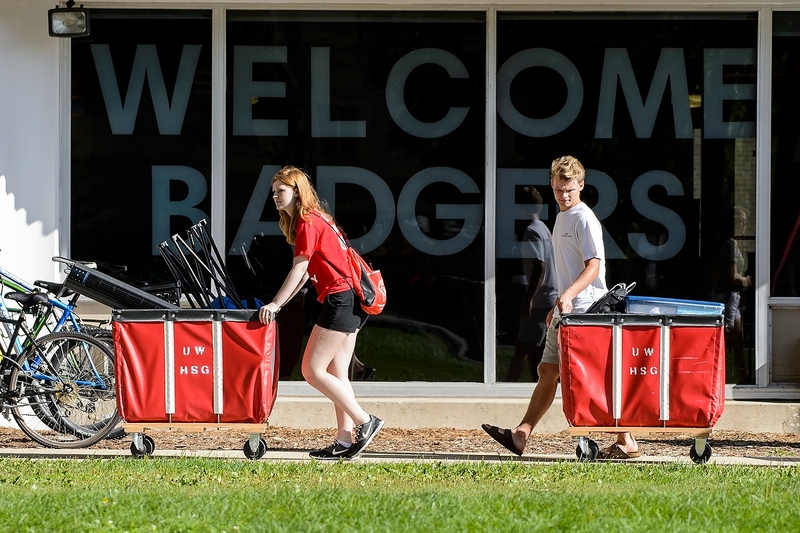 Move-in is expected to be complicated this year by street closures due to flooding; officials recommend avoiding the isthmus and instead approaching campus from the south and west. Traffic routes given to residents and families in their move-in information are expected to remain open as planned. See city flood updates here and UW–Madison alerts here. In addition, a renovation project at Witte and construction of the new Nicholas Recreation Center may affect traffic routes and parking spaces. Signage and volunteers will help families navigate around the construction. Move-in days are August 26, 28, 29 and 30. Students are welcome to move in any time after 8 a.m. on their assigned move-in day; residents in some halls are given a time range. —Observatory Drive from Charter Street to Babcock Drive will be restricted to primarily move-in traffic and will be one-way west on Aug. 26, 29 and 30. —Elm Drive north from Observatory Drive will be restricted to primarily move-in traffic and will be one-way north. —Lake Street between Johnson Street and Dayton Street will be restricted to primarily move-in traffic and will be one-way north. —Frances Street south of Dayton Street will be closed to traffic on Aug. 26, 28 and 30. —Dayton Street from Frances Street to Park Street will be closed to through traffic. Access will be restricted to primarily move-in traffic and will be one-way west on Aug. 26, 28 and 30. Additional information and maps of parking/unloading areas during move-in can be found here.